The Powerbeats3 are a good pair of headphones, not great. And unless you get them on a good sale the asking price of $199 is way too much. You might remember how on September 7th of last year, Apple decided to ditch the headphone jack in favor of going wireless: a move I still have plenty of feels about. But to help the transition go a little smoother, they announced the Powerbeats3 wireless headphones on stage, along with the Airpods, Beats Solo 3, and BeatsX. Every iPhone 7 even came with a pair of lightning earpods and a dongle to connect your favorite now-outdated pair of headphones (#Donglelife). Well I’ve been using these headphones for roughly a year now, and thought it’d be a good to share my experience with the Powerbeats3 to find out if they’re worth the money, after all this time. So if you don’t know, the Powerbeats3 were made to be used for fitness—but oddly enough one of the complaints I keep hearing about these is that they get destroyed from sweat. Now I do find it weird that they don’t have any sort of official IPX rating, instead all you’ll find on the matter is Beats saying on their website that it’s, “Sweat and water resistant to handle tough training”. Even the micro USB charging port is completely exposed with not even a rubber flap to keep moisture out, so I can see how this might be an issue. That said, I’ve been sweating into these for a year. Every time I’ve gone to the gym and for most of my runs (besides when I’m testing out another pair of headphones), I’ve defaulted back to these and I haven’t had any problems with them with sweat damage. The issue that I do have far more often is that once sweat gets on the ear tips they slip out fairly easily. Luckily, the ear hooks keep them from really falling off, but I find myself trying to stuff them back in more often than I’d like towards the end of a workout. This is a problem if you like to build up a sweat in noisy environments. One thing I do like about the build quality with these is that the plastic they’re made of seems to be able to withstand a lot of abuse and still look good. Now these are by no means brand new, but for as much as I’ve used them: they still look good enough that I wasn’t too worried about shooting video of them. The ear hooks are also somewhat flexible so I don’t get any discomfort on the top of my ears—which happens sometimes when headphones are a little stiff. The cable is flat, which is a big plus when you have to stuff these in your pockets on your way to the gym, but it also comes with a sliding adjustment piece so you can tighten these to the back (or the bottom) of your head for a more secure fit. The control module on it is also minimal and sleek, but it’s not perfect. If you’re using them casually the click feels fine, but when exercising and in motion sometimes you’re not entirely sure if you’ve even clicked the button or not. A little bit more of a clicky feedback would work wonders in my opinion. I can’t tell you how many times I’ve clicked to pause, then clicked again because I thought I hadn’t clicked it right the first time only to have the music pause and start again super quickly. It’s a little annoying. The last button can be found on the left earbud. It acts as the power button and Bluetooth pairing and it’s located right next to a tiny LED light to let you know which mode it’s in. The other most annoying thing to deal with was initially getting these headphones to pair. On iOS it wasn’t an issue at all thanks to the W1 chip that makes pairing a breeze. But though I occasionally test products with an iPhone just to see how they work, my daily phone is a Google Pixel—and I consistently had issues when I first get to the gym, turn on the headphones and Bluetooth on my phone, and try to get them to pair. My phone says connected, but audio doesn’t come through the headphones until I disconnect and reconnect at least two or three times. You can imagine how annoying this gets. Once properly connected it’s smooth sailing, but it’s always a bit of a headache at the beginning which wasn’t an issue when I first got these headphones. While working out I haven’t experienced any skips, which is great since they can really take you out of the zone. The same can be said about the range: whether my phone was in my pocket or in another room I haven’t experienced any issues so whatever they did to get the Bluetooth connection to be this solid is working. It would’ve received a way higher score in the connection aspect if only I didn’t have to go through the trouble of repairing them every time. Of course the W1 chip also pairs it instantly across devices on your iCloud account so you only need to connect once if you’re on iOS, but as I only use these at the gym it doesn’t really affect me much. I honestly don’t think I’ve ever used these on my computer besides my initial testing a year ago when I wanted to make sure the iCloud syncing actually worked (which it does). Whether you’re on Android or iOS, the controls also work the same. So you can click the middle button to pause or play, double click to the skip to the next track, triple click to return to a previous track, and hold it down to access Siri or the Google Assistant. Then there’s the volume buttons which have the perfect amount of click to them. Something that I wish the squishy middle button had. As far as battery life goes Beats claims these can get you 12 hours of constant playback, but in our testing we got about 10.5. Though it falls slightly short of the claimed 12 hours it still lasted me a solid 3 or 3 days at the gym ithout me worrying about whether or not I needed to throw them back on the charger. They also have a quick charge feature which give you roughly an hour of battery life in just a five minute charge so in the time it takes you to get dressed you should be good to go. I shouldn’t have to tell you that Beats is known for their overly emphasized low end, but one thing that they were also known for is their output. The Powerbeats2 got really loud, which some people enjoy when they’re pushing themselves to the limits. The Powerbeats3 definitely pulled back on that maximum output which I enjoy because I like my ears and I enjoy hearing, but you might not agree if you’re one of the people that needed crazy high volume in the gym. You won’t get that same output with these. Of course this leads to a slightly meeker bass response, but only when compared to the previous generation. These are still a bass-heavy pair of ‘buds. The song “Nightcall” by Kavinsky is a perfect example of this where the kicks throughout the song are meant to be a rhythmic, rolling way to keep the beat going. Present, but somewhat in the background just to keep your head nodding. But with these they’re basically the main attraction. Because of this elements in the mids tend to be overshadowed. This can be seen in the song “Linda Morena” by Quantic where the trumpets (which is usually an instrument at the forefront of a band) gets muffled somewhat once the percussion elements come in during the intro. In this same song the subtle cymbal hits throughout the chorus sound more like a hiss than a cymbal. Like they’re being squeezed through a narrow hole instead of being allowed to reverberate throughout a hall. Overall, I like these headphones for what they were made for: the gym. The overemphasized bass does give me an extra push when I need it, but I use a different pair of headphones throughout the day to actually listen to music. These only come out of my bag when it’s time to exercise. Once I deal with the hassle that is connecting to them, I get very few if any skips during my workout and I haven’t had any issues with sweat damage so far. Are they perfect? Definitely not. But should you buy them still, a year after they came out? I would say no unless you get them on some crazy sale. They’re good, not great, and definitely not $199 great. 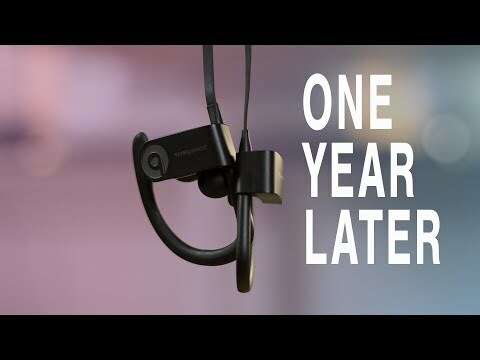 If the past Powerbeats cycle is anything to go by these won’t be updated for at least another year, but I bet they’re going to be regularly priced at $199 right up until the Powerbeats4 come out. In the meantime you can get a number of other headphones from our best workout earbuds list that will save you a good amount of money, even if they don’t have that same bumping bass that Beats is known for.